Looks a great price for this camera. I'll let you click the link for the specs as always but I think I may just go beyond my original search (for a fairly simple compact ) and seriously consider this one at this amazing price . Though I'm sure you can get it cheaper than £449 -I cant find it anywhere close to £250. Beautiful camera, oozes quality, fantastic price! Waiting for the Sony A6000 to drop personally. Yes it oozes quality but I found it terrible to use, even with updated firmware. Made my x100 feel like a speed demon. Good price though if it's really what you want. My 400D broke. Would this use existing lenses? Does this also record video, can anyone comment on quality? My 400D broke. Would this use existing lenses? Does this also record … My 400D broke. Would this use existing lenses? Does this also record video, can anyone comment on quality? No this uses M lenses. However I am selling my 600D, I'll PM the link! Technically no, but there is an official adapter. Not sure about video though. Excellent kit if you want a compact video setup. Full HD 1080 24 Touch screen Control. Use of EF lenses with adapter and external mic (with hotshoe). Same sensor as the 650D. Not so great for photos as the AF speed is laggy. Much Improved with latest firmware but still no match against competition. Great Camera. On the issue of Auto-Focus I own both an EOS M and a Nikon D5200. The EOS AF it is not fast by any means, but, post firmware update I was surprised that it really is not that much slower than my Nikon DSLR....at all. Hot from me. What's the video quality like? Is it auto focus? I have one of these and use it to compliment my 5D. At this price it is good, although I would not have paid full price. The M lenses that are available get an excellent write up and the included 18-55 kit lens is good, better in my opinion than the 18-55 kit lenses bundled with Canon SLRs. There has been a lot of criticism, but I think if you are buying this camera have a good look at the comments on dpreview.com and then buy with open eyes. I haven't regretted it. Canon missed the bus as far as mirror-less cameras go. Any good deals on the x20? Had one of them before, was a load of crap. Love the build quality & the image quality, but the AF is too slow for me, even after latest firmware. Mine got extremely hot too so I returned it in the end. I think it's a good price and the lenses are great but the auto focus still lets it down. For under £250, an excellent deal.....I notice John Lewis and Jessops are doing it for £50 more. Only ( possibly ) major downside to it is the slow AF, according to most reviews. Same with Nikon, both companies seriously fearful of harming their SLR sales with mirror-less - in the their big USA market where size is everything, compact system cameras are still treated with some suspicion. Since the latest firmware the AF really isn't that slow at all, it's actually pretty good and always bang on, unlike DSLR phase detect. Not really suitable for action photography, but not many mirrorless cameras are really. 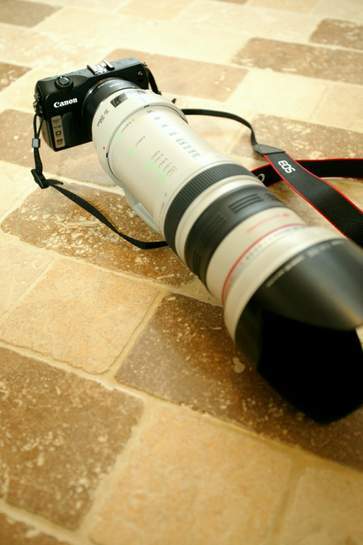 All your Canon lenses work perfectly with the official EF-EOS-M mount adapter as pointed out above. At £250 this is a lot of camera for the money. Hi all. I've got his camera from the Black Friday sales and it is a great bit of kit for the money!! The lack of viewfinder isn't a biggie for me and a couple of spare batteries of amazon for £20 negate the extra battery drain from using a LCD. With the latest lens and camera firmware it's not bad on the AF but you can enable AF+MF or go to full MF if you want to too. 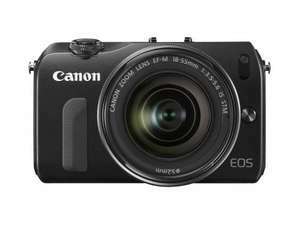 Compared to other " basic 1000 series cameras or even 600/700s it's not bad and the price saving is great! Also sorry to the Op for reposting this: beat me to it! Given that the M2 isn't even being sold in Europe, I'd guess that these are so cheap because they're pretty much giving up on the platform. I got this as a second camera to my 60d about a month ago, can't tell the difference in image quality. Its really really worth it! ... Forgot to say,the 18-55 kit included with this is very high quality too, as is the 22 f/2. Great camera, have one myself as an alternative to my DSLR's. Focus is not as fast as the other mirrorless cameras but according to various reports that didn't stop it becoming the 2nd most popular CSC in Japan last year! As others have said quality is fantastic as it has pretty much the same insides as a 650D minus the mirror. Fairly sure it's the same sensor that Canon have been using for year throughout their entry level > enthusiast product line. Also worth getting MagicLantern installed on it if you intend to use any manual focus lenses. I've been using a range of M42 and old L39 glass on mine lately with some fantastic results! Went for it. Any good deal for the 22 f/2? Some ridiculously low prices on eBay. Around £77 for UK stock split from a kit (available from quite a few sellers upto 60 Day Warranty). £98 from CEX (with their 12 Month Warranty). Around £77 for UK stock split from a kit (available from quite a few … Around £77 for UK stock split from a kit (available from quite a few sellers upto 60 Day Warranty).£98 from CEX (with their 12 Month Warranty). £57, (or lower if you make an offer) if you're prepared to go for an import, I would. Now were talking. This is the deal of the century. Not suitable for fast moving sports, pets, etc. But suitable for everything else. I purchased the EOS-M a few months back from Jessops. £349, less £50 Canon cashback at the time. Offer included the genuine Canon EF mount adaptor, (£100 value) so in real terms, a body cost of £200. I use the 7D as my main camera system. However, it is mainly used when I know I won't be too far from my car. The EOS-M is my hiking / walkabout camera. I have the 18-55 kit lens, which is optically superior to the lens bundled with most Canon entry level DSLR kits, but I also own the 11-22mm and the 22mm prime. It is with these lenses that the EOS-M really comes into it's own. It is easily a match in virtually every respect for the 100D, the DSLR model with similar specification. As other posters have commented, focussing is not as quick as a DSLR, but that is typical of most mirrorless designs. The current firmware did make a significant difference, and folks who base their judgement solely on reviews should be clear what firmware was in place when the review was written. I have only used the EF lens adaptor on a couple of occasions, but have found it very easy to work with.